Sail materials and designs have come a long way, but all the choices can get confusing. 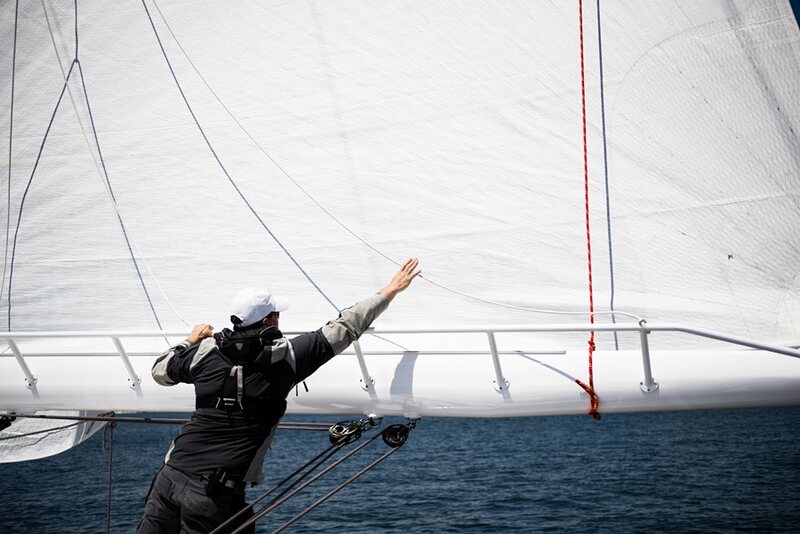 Quantum's Dave Flynn demystifies the better sail options on the market and how to choose the right one for your sailing style. It’s time for our semi-annual review of sail construction and material options. While most of this is well documented, an overview is handy, given the bewildering variety of ways available to build a sail. In the good old days, the whole debate centered on the weight of sailcloth you were going to use. It is a lot more complicated now, and you have to sort through configurations that can as much as double the price of the base model. The good news is that the sails are also much better. You will be blown away (no pun intended) by how much better your boat sails with new sails, no matter what the flavor. All cruising sailors list durability as a primary design criteria, so, no matter how you build it, this is a given. Each of the design approaches we will discuss will be durable. Ease of handling and performance are next on the list. Performance in terms of pure speed is usually played down. After all, we are carrying our house around with us; how fast can we expect to go? More important are issues of control. How can we minimize weather helm and heeling and create a balanced, easily-steered boat? How can we make a partially-furled headsail or a reefed mainsail be effective? How can we make our sail handling systems work better? Each of these criteria comes down to good design and engineering backed up by one critical factor: stretch. Minimizing stretch is the key to maintaining sail shape, reducing helm, and heeling, and making sails versatile and easy to use. It also makes sails nice to look at. This is where how's and what's of sail building come into play. There are three basic options: classic, cross-cut construction using panels of pre-made woven materials running luff to leech; tri-radial construction, where panels are oriented out of the three corners in an attempt to mimic the primary load pattern in the sail (various material options, again using off-the-shelf fabric, are available); and membrane (Fusion, Stratis, 3DL/i, etc. ), where sails are built as an integrated whole with a custom fiber network using a variety of fiber types. As you as you move up the progression of sail construction, stretch is reduced. Tried and true, woven polyester (usually referred to by the Dupont trade name “Dacron”) is how the majority of cruising sails have been built over the last 50 years. It is still the standard on small to medium size boats. Though tough to tell apart, woven polyester comes in a wide variety of grades, and – you guessed it – stretch characteristics define quality. All of the major producers have various levels. What makes the best, lowest-stretch option is a combination of ingredients. First, all polyester yarn is not created equally. Some yarns have higher tenacity (breaking strength) and higher modulus (ability to resist stretch). The best fabrics use high modulus fiber in both directions (warp and fill). The second element is yarn size. Smaller is better, since it allows the weave to tighten, with more fiber packed into a given space. It is primarily the tightness of the weave that allows the material to resist stretch when pulled at an angle to the fiber (the bias). In a cross-cut panel layout, there is a lot of bias loading, so, in many ways, this is key to shape holding. Shrinkage also plays a role. As the raw, woven goods are finished, they undergo heat and pressure to help pack the fiber. More shrinkage helps tighten the weave. Finally, the resin finish that is applied in the final stages helps fill in the gaps and keep the weave together. More resin makes the fabric crisp and firm, helping minimize stretch, though it does keep the fabric from having that “soft and easy-to-handle” feel. Less expensive tiers of woven polyester use larger fiber bundles of lower modus fiber, less fiber, and generally coarser weaves. A woven polyester sail out of the best materials rates about a five on a scale of 1-10 (with 10 being the best) in terms of shape holding. Performance deteriorates relatively rapidly as resignation is flogged out of sails and UV breaks down the yarn. If durability is measured in life as a triangle, you should expect 3,500-4,000 hours of use. This is highly dependent on the amount of sun and flogging a sail is subjected to. Orienting the panels out of the three corners means that the primary strength of the material needs to be in the long (warp) direction, as opposed to the short (fill), which you would find in a cross-cut sail. For the most part, this suggests a composite material that doesn’t rely on a tight weave for bias control and can use big straight yarns in the warp. If you want to use woven materials in a tri-radial sail, the problem is more difficult. In weaving a woven material, the warp fiber is stretched out on the loom and the fill fiber is rammed through. The fill remains straight while the warp gets bent around it. This over-and-under that the warp is forced into is called “crimp.” Crimp creates stretch, since the yarn has to straighten out before it can bear load. This is why material woven on a loom are inherently “fill” oriented. To make a woven fabric with its strength in the long direction, you want to eliminate crimp and increase the size of the warp yarn, but this creates other problems. The larger fiber reduces the tightness of the weave, which leads to more bias stretch. For years sailcloth producers have struggled with this conundrum. Until recently the best result was a balanced material that could be used in smaller, lower load applications. The latest generation of radial woven materials uses large warp yarns, or mono filaments, and overpowers the fill yarns in the shrinkage process, pulling the warp straight and forcing the fill to go over and under. This provides sufficient warp strength for higher loads, but the bias characteristics suffer. The hope is the more efficient tri-radial panel layout will minimize bias stretch. Another way to add strength in the warp direction is to augment the weave with a high modulus, ultra-high molecular weight polyethylene (UHMP) fiber (Spectra and Dyneema) inserted at intervals. Hydra Net, developed by Dimension Polyant, is the best-known of these hybrid wovens, but several suppliers now have versions. These help the high-load stretch resistance, though they don’t do much at low loads. The other downside is cost, since the material is very expensive. They make for a very rugged sail, since the UHMP fibers also have very high tenacity, good abrasion resistance, and excellent UV properties. There are versions offered for cross-cut construction as well, but these cannot take advantage of the tri-radial panel layout. Composites are the logical answer to tri-radial construction. A fiber network of large, straight yarns with a warp orientation bears the primary loads. Exterior skins of woven polyester (taffetas) protect the fiber and provide chafe and toughness. A polyester film, equally strong in all directions, provides bias strength. Fibers can be of any type and range, from standard polyester right up to carbon and UHMP. Compared to a standard woven material, a polyester composite might have 20-40 percent less stretch along the warp and nearly double the bias resistance. A carbon composite might provide five times the stretch resistance. It is no wonder that, as boats get bigger and loads go up, these high modulus options begin to make sense. The knock-on composites always have potential for de-lamination and mold and mildew. Modern composites have come a long way, and de-lamination is now a rare event. Mold and mildew still can grow, particularly in a sail that is left furled up in a warm, wet environment. However, internal treatment of the adhesives and exterior coatings have also helped address the problem. The bottom line is that tri-radial construction improves shape holding and shape life. On that same 1-10 scale, you could be starting at a 6-9 (depending on fiber type). Just as important, a 4-year-old composite sail can look virtually unchanged, something that cannot be said for cross-cut woven sails that deteriorate relatively rapidly. Shape life will be dramatically better. Cost will increase 25-30 percent for a tri-radial option, up to 40 percent for a polyester composite, and up to as much as 50 percent for a high modulus composite. Part of what makes them more expensive is that, in cutting the triangles and trapezoids that make up a tri-radial, there is 20-25 percent fabric waste. The ultimate way to build a composite cruising sail is to not be limited to pre-made materials and the jig saw puzzle of a tri-radial panel layout. On bigger cruising boats, this is now the standard approach. Membrane construction allows sails to be designed as a one-piece whole. A network of fiber or filaments of any type and quantity can be applied in any direction to address loadings in a smooth, continuous fashion. Taffetas, films, or other custom surfaces can be used. Strength can be introduced to address reef or partially furled loadings. Though polyester can be used, typically membranes utilize high modulus fibers like aramids, Technora, Vectran, Dyneema, or carbon. As a testament to durability, this is the standard construction for sails over 60’ and super yachts, where size and sail loadings demand higher strength, and where ambitious sailing plans mean lots of miles. On our performance scale, membranes top the charts at a ten. They are inherently smoother than a paneled sail. Fewer seams also allow for less water egress, so mold and mildew issues are greatly reduced. Costs are higher – typically double the cost of a base woven sail – and the degree of customization has a big effect. Highly specialized design tools are required to properly engineer the structure and intelligently get the right amount of fiber in the right places. It also takes tremendous investment in production facilities to create and laminate. Given these economic constraints, high-end membrane construction is limited to a small number of sailmaking firms who have the experience, personnel, and resources. No matter which construction type or material you select, you will find that the latest cruising sails stay intact as a triangle, and, more importantly, perform better as a critical airfoil for far longer than sails from previous generations. Just keep in mind as you consider new sails that staying in one piece is a relatively low bar to set. The high bar is how well and how long they will perform as a critical airfoil. Don’t kid yourselves that sail shape does not matter because you’re just cruising. With a limited sail inventory and the requirement for a long lifespan, making a great cruising sail is actually a much more challenging design problem. This article originally appeared in the April 2017 Blue Water Sailing magazine.